The mat's were quality and the colors were accurate. The silver frame looked very nice. Hello Glory. We sincerely apologize for any inconvenience. This is not the shopping experience we want for you. Thank you for speaking with me over the phone, and allowing us to find a resolution for you. The replacement order shipped today, 03/29/18, and will arrive tomorrow via Next day air. If you need anything else, please do not hesitate to reach out to us. Thank you for your business. We have an awesome photo from Alaska that needs a special frame to accentuate its reflective nature. Hoping this will do it justice. Matched previous frames in an arrangement. I chose this for it's clean, contemporary look. I'm framing a section of an old stained glass door and I needed the frame to match the lead in-between the panels. Can this be used for a mirror? BEST ANSWER: Yes. It would be just like putting glass in a frame. I would order the foamcore backing to go along with it. This would keep the mirror from slipping around the frame. And protect the mirror from breaking. We advise against using mirrors in metal frames. More info please on $$ASV . Need the frame rail dimensions? Need 1 1/2 depth to wall by 1 1/2 bevel width. BEST ANSWER: Hello Daniel. The width of the frame is 7/8'. 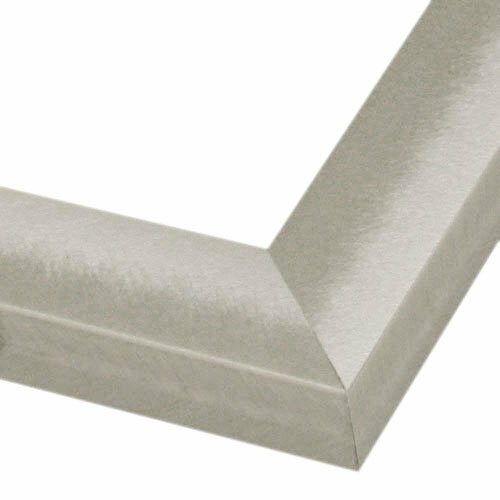 The depth of the frame is 1/2" and is not available in a 1 1/2" depth. Thanks!